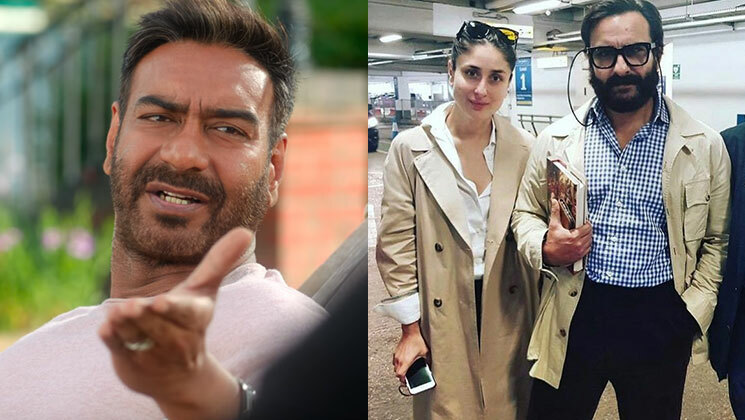 Saif Ali Khan has finally spoken up about the infamous dialogue in ‘De De Pyaar De’ where Ajay Devgn talks of the age difference between Saif and Kareena. While many people on social media thought that Devgn was taking a dig at Saifeena, it seems the Nawab Of Pataudi took it pretty sportingly. According to a report in DNA, when Saif came to know about Ajay Devgn’s dialogue, he said, “Hey, that’s cool, man.” Saif also went on to add that he was really happy that Ajay was experimenting with such ‘cool’ characters. It’s lovely to see the two share such a loving camaraderie together. Ajay and Saif have been great friends since a long time. The two worked together in ‘Omkara’ before, which went on to become a massive hit at the box-office. They are soon going to come together onscreen in ‘Tanhaji’. The two are shooting for the film together currently. Talking of ‘De De Pyaar De’, Ajay will be seen sharing screen space with Tabu and Rakul Preet Singh. The trailer of the movie was released on Ajay’s 50th birthday, and it has been going viral ever since. The film looks fun from the outset and people are dying to watch it when it releases. It promises to be another roller coaster ride coming from the stable of Luv Ranjan. ‘De De Pyaar De’ hits theatres on May 17.